New York state is the US state with the second most film jobs, second only to California. And unsurprisingly, about two thirds of those New York film jobs are concentrated in New York City, particularly in Manhattan. In addition, Manhattan is home to film school institutions such as Katharine Gibbs School, New York Film Academy and numerous colleges and universities all with their own film departments. Therefore, it’s no wonder that countless people, not just students, move to NYC yearly looking to break into the film industry. The formula to break into the film industry? There isn’t one! Or is there? Well, we’ll say there isn’t…at least not one that fits every individual. Filmmakers have various backgrounds and training (or lack of), but it’s okay. That is not a measurement to keep them out of the film industry. You don’t have a film degree, that’s awesome! You don’t need one. You have a film degree, that’s awesome! More practice for your theory. Now, go ahead and make your film. Jump right in. But don’t jump into an empty pool. 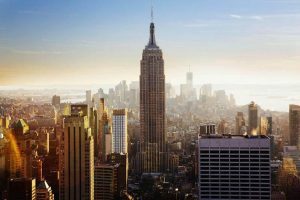 DON’T JUST MOVE TO NEW YORK, MOVE TO NEW YORK CITY: New York City is comprised of five boroughs. Move to one of them. If you’re outside of the boroughs you’ll be very limited, specifically due to transportation inefficiencies and costs to get the New York City. PUBLIC TRANSPORTATION, IN NEW YORK CITY: You’ll find that public transportation in New York City is widespread. You can get to pretty much anywhere in the city’s five boroughs via the train &/or bus 24 hours a day. However, at times, especially during peak hours, the public transportation system can be clogged with delays. And also, costs seem to go up every year, a slight percentage. But service quality does not seem to keep up or improve with the increase in price. A PLACE TO LIVE: Rent is super expensive. Many people in NYC are looking for roommates. It could be you! Some stay with a relative, could that be you? It’s imperative that you have a place to live. You may think you can wing it in the summer, but the winters are brutal. You do not want to be left out in the cold. RESOURCES: Reach out to Made In NY. They have a production assistant (PA) training program; for NYC residents only. Also, each borough has and independent television branch. They offer film equipment rental free of charge, so long as you live in their borough and take their training classes. For example, Brooklyn’s independent television branch is Brooklyn Free Speech, bricartsmedia.org. A PLAN: What will you do? Who will you reach out to? How do you know who to reach out to? What if you’re reaching out and no one is reaching back? Make sure you answer these questions or have a plan to resolve these questions if the need be. 3-6 MONTHS EMERGENCY BACK-UP FUNDS: This is to get you through while you look for opportunities and establish some sort of cash flow. The more the merrier, so it’s said. AN INNER DRIVE TO NOT GIVE UP OR COMPROMISE YOUR MORAL CODE: This is essential or else you’ll end up compromising not only your moral code, but your faith, your essence, who you are! I’m sure you have heard this before, “If you don’t stand for something, you’ll fall for anything”. Great quote, but can’t tell you who said it. No one accurately knows. With that said, self examine and see if you’re ready to dive in. And you don’t have to dive in the deep in, not right away. It’s advisable to make visits to NYC, maybe a few times, during different times of the year, and hang out by the shallow end and every now and then even get your feet wet. Eventually you’ll build the confidence to jump in, on the deep end. When you do, it’s on! Don’t let that scare you. NYC is a world of its own. Though callous at times, it’s inspiring and educational, in some sorts, most of the time. These are some of the films that Zandir participated in as a PA and/or intern early in his film career in New York City. And below are button links to preview and/or view some of Zandir’s films available on MarilynFilms.com. If you’d be so kind to view the films, we’d love to hear your take on them. Also, stay in touch by subscribing to our newsletter. We’ll keep you updated with everything MarilynFilms.com and you’ll receive promo codes directly to your inbox. Cheers 🙌🏾.